OneHumor | TAKEAWAY DOODLES - OneHumor is a collective of cool content featuring funny videos, funny movies, classic TV ads, virals& silly pictures. 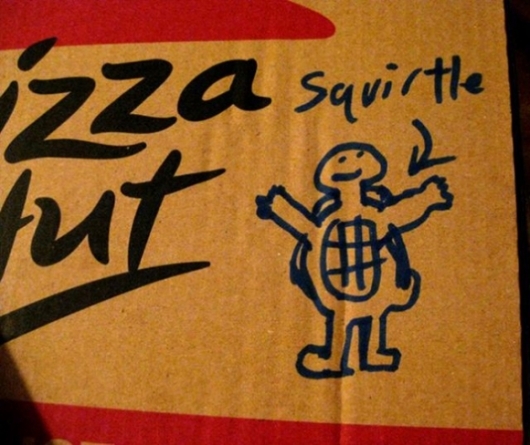 People are requesting doodles on their takeaway boxes, with surprising results. I'd be scared that the surly recipient of my order would decide to smear his or her own bodily excretions on my food rather than getting arty. Quite possibly the best combination of exotic objects to make men drool over on the planet, it's a magical combination. For once if you fail to notice the cute chick in the photo you are not gay! Most of the time when people draw on street signs its pointless vandalism and the streets look worse for it but here are some of the rare bits of vandalism that are neither pointless nor unwelcome. The joys of being a student, you sleep in late, go out all night partying. But the downside, shared accommodation with a pedantic psychotic flat mate who leaves you crazy notes. Here's some of the coolest watches I've ever seen. These are sure to impress fashion freaks and techno geeks around the world! Some say that E3 isn't what it used to be. That it's become more of an event for industry insiders that actual gamers. If these pictures are anything to go by though, those reports have been greatly exaggerated. A full century of attractive pictures of ladies heralding from the 4 corners of the internets. From web celebs that you may know, to others that you won't, every single one is worthy of some serious mouth dribbling. Phew! Movie magic really is a hell of a thing. They can take an average looking actor and turn him into a 7 foot tall monster, or a midget with hairy feet. Also they can take Chuck Norris and make him look like, well, Chuck Norris. Amazing. You just know these are road accidents just waiting to happen. Witness some of the more ingenious ways of trasporting, well, pretty much anything in a vehicle usually built for one or two passengers.